[Expat Life] Top 4 places to visit in Nigeria by Expatriates consultants! What can i do in Nigeria? What should I visit in Nigeria? That being the case, we would like to propose our Top 4 places to go to during your rest periods, your holidays, or simply your free time in Nigeria, directly suggested by our consultants who have lived in this country! Nigeria is the leading African economic power. Considered as little tourist, it has many attractions and interesting sites to visit. 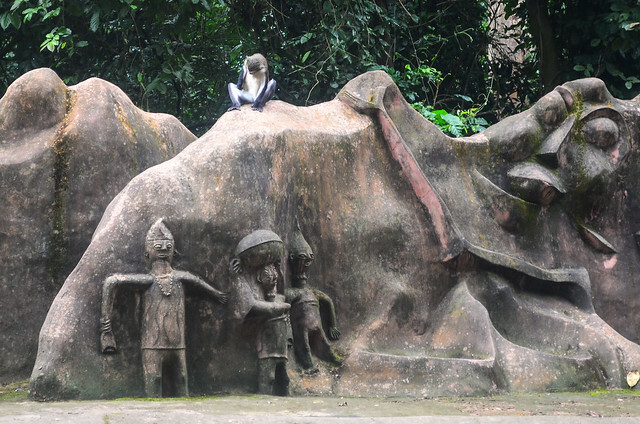 UNESCO World Heritage Site, this forest is located on the outskirts of the city of Oshogbo. It is defined as the home of Osun, one of the deities representing River and Wealth, in the Yoruba pantheon. You will discover many sanctuaries, sculptures, works of art highlighting Osun, as well as the associated river. It is a sacred place ideal to visit! This park is considered the largest as well as the most popular in the country. Located in Nigeria’s Bauchi State, it is home to baboons, hippos, lions, crocodiles, antelopes, elephants and many other animals. The place also has a lake and natural pools formed by the hot springs of Wikki, with a constant temperature of 31°C. Go discover this place, it’s beautiful! It is the largest city of the African continent. Lagos is teeming with people: 21 million people live in this agglomeration. We advise you to walk between the two islands of Ikoy and Victoria Island. These are the living and warm residential and business districts. These areas are safest where most expatriates live. To get there, take the Third Mainland Bridge, a huge bridge connecting these two islands. Located east of the city of Lagos, Lekki spreads a hallucinating architecture and has sublime beaches that will delight your desire to escape. Very much liked by Nigerians, these beaches are very popular during the summer months. Do not miss a sunset at Lekki ! C’est un mélange parfait entre les couleurs bleu azur de la mer, et l’orangé du crépuscule ! You would like to mobilize your teams in Nigeria as well? We can help you!